LEWISTON — The recipe for success that Edward Little used to win its first three games was nowhere to be found during its fourth game Wednesday night. 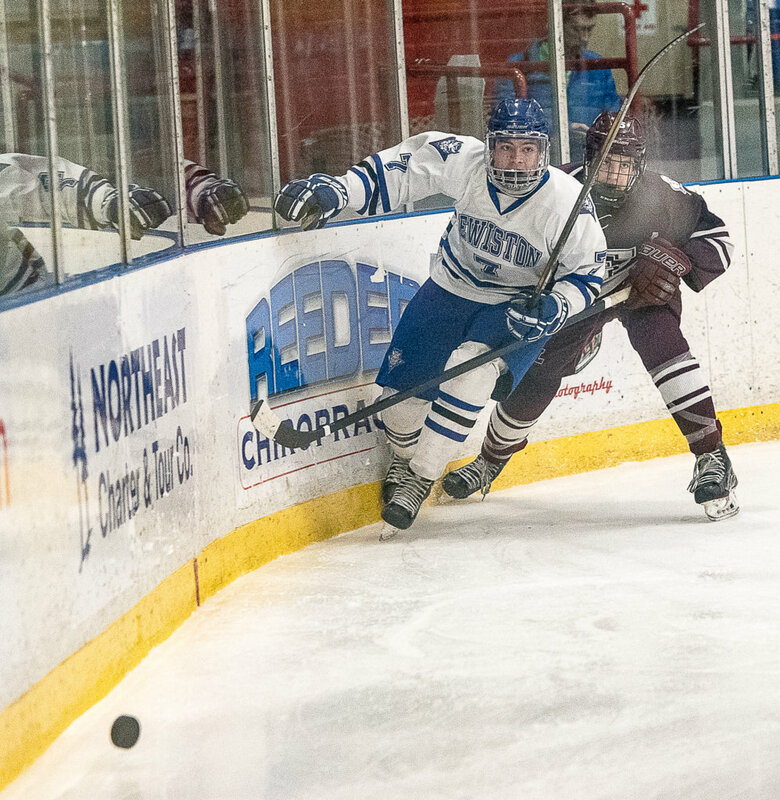 Instead, the Red Eddies found themselves in the penalty box far too often, and because of that found themselves behind on the scoreboard to rival Lewiston. 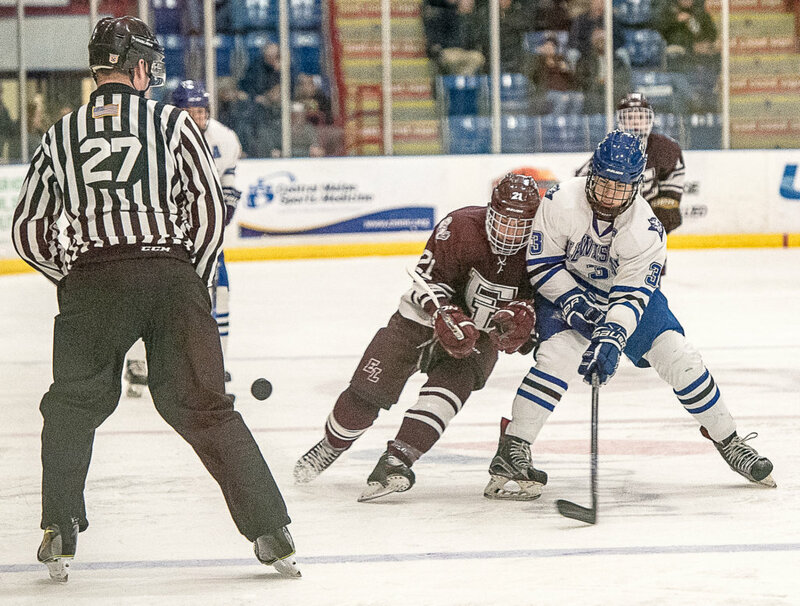 The Blue Devils scored three power-play goals en route to a 6-1 win in a Class A North boys’ hockey rivalry clash of unbeatens at Androscoggin Bank Colisee. The trips to the penalty box began in the game’s opening minute. First the Red Eddies (3-1), then the Blue Devils (3-0) less than a minute later. EL was called for its second penalty before the first one had expired. Two more Red Eddies penalties came 28 seconds apart just over six minutes in. The Blue Devils then took advantage of being two men up. Dustin Larochelle scored during the 5-on-3, then Evan Cox made it 2-0 on the man-up 55 seconds later. Lewiston kept its foot on the gas pedal and scored a third goal 1:14 later, thanks to a little luck. Jacob Story’s shot went wide left, but the puck kicked off the end boards, then bounced in off the back of EL goalie Ben Feldman. Penalties were the story again in the second period, with each team getting whistled three times. The Red Eddies had a two-man advantage less than six minutes in, but couldn’t capitalize on it. The Blue Devils took advantage of another two-man-advantage to go up 4-0 late in the frame. Jayden Wilson was open and ready by the right post for Sam Frechette’s pass soon after a 5-on-3 turned into a 5-on-4 with just under four minutes left in the second. Sam Laroche made it 5-0 when a nifty unassisted goal flipped over Feldman with 18.2 seconds before the second intermission. The start of the third period saw empty seats in the penalty box. The Red Eddies used the extended even-strength play to put themselves on the scoreboard. Eli Thibodeau scored from Alex Landry 5:45 into the frame. Tyler Marcoux rounded out the scoring by jumping on an EL turnover in the crease with 2:39 left to play. The teams combined for 18 penalties, the Red Eddies accounting for 11 of them. “I told the kids, ‘You got to put this one behind you, and we got to move on to the next game,'” Gagne said. 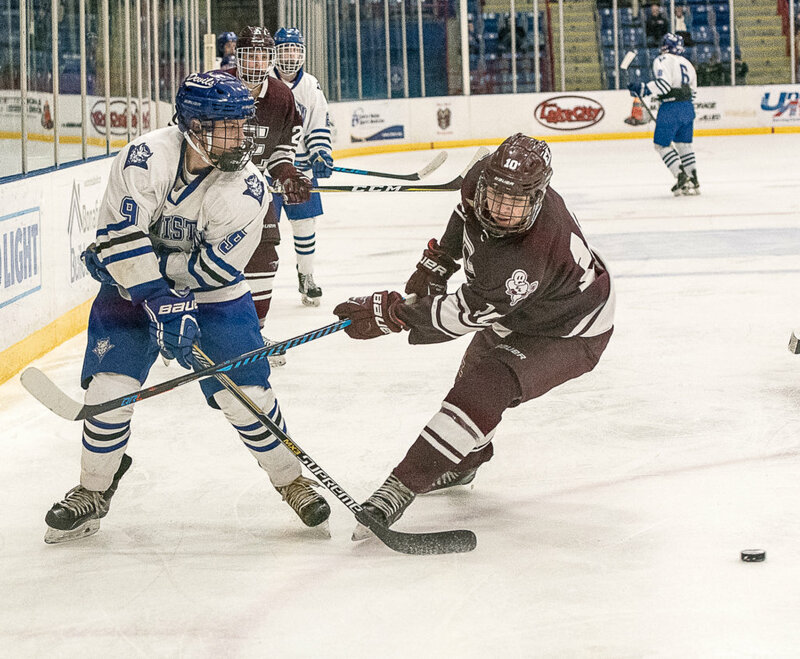 Feldman stopped 24 of 30 shots, while Conrad Albert made 10 saves for Lewiston.